Lake Iseo or Lago d'Iseo or Sebino is the fourth largest lake in Lombardy, Italy. It is situated in the north, in the Val Camonica, near the cities of Brescia and Bergamo. Its surface is also divided between the homonymous province. Although it is one of the world's most industrialized areas, is situated in an area of ​​great natural and ecological wealth. In the middle of the lake lies the island Monte Isola, the largest lake island in southern Europe. An Island Slideshow: Lavrukhin’s trip to Monte Isola (near Sale Marasino), Lombardy, Italy was created by TripAdvisor. See another Sale Marasino slideshow. Create your own stunning free slideshow from your travel photos. 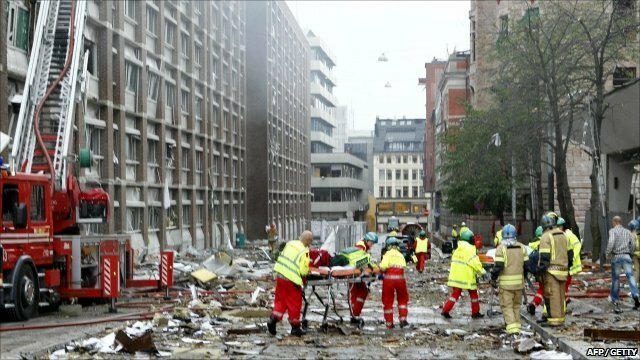 A massive bomb blast has hit government buildings in the Norwegian capital Oslo, killing at least seven people and injuring several others. PM Jens Stoltenberg described the situation as "very serious". The bomb was followed by a fatal shooting incident near Oslo at a youth meeting of the Labour Party, which Mr Stoltenberg leads. Norwegian media said at least four people were killed when a man opened fire indiscriminately. Police said the suspected gunman had been arrested, TV2 reported. No group has said they carried out the attacks but police say they believe them to be linked. Hours after the bomb struck Oslo, officials said some people were still inside the damaged buildings, some of which were on fire. Television footage from the government quarter showed rubble and glass from shattered windows in the streets and smoke from the fires drifting across the city. The wreckage of at least one car could be seen. All roads into the city centre have been closed, said national broadcaster NRK, and security officials evacuated people from the area, fearing another blast. Mr Stoltenberg, in a telephone call to Norwegian television, said all government ministers were safe. He said he had been advised by police not to reveal his current location, but is not thought to have been in central Oslo on Friday. "Even if one is well prepared, it is always rather dramatic when something like this happens," he said. Egil Vrekke, Assistant Chief Constable of Oslo police told the BBC the rescue operation was ongoing. "We are issuing warnings just [to] make sure people are not in the area in case there are further explosions," he told the BBC. "We have cordoned off large areas. There are bomb experts at the scene investigating whether there are other devices in the area." A spokesman for Oslo University hospital said 10 people had been taken there for treatment, some with serious injuries. A few hours after the explosion, reports emerged of the shooting at a Labour Party youth camp in Utoeya, an island outside the capital. TV2 said at least four people had been killed and several injured - there were reports a gunman was wearing a police uniform. "This created a panic situation where people started to swim from the island" said Labour Party spokesman Per Gunnar Dahl. Mr Stoltenberg, who had been due to visit the camp on Saturday, told TV2 the situation in Utoeya was critical. State Secretary Kristian Amundsen said Friday was a public holiday in Norway so the government offices were not as busy as they might usually have been. 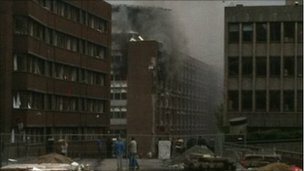 Assistant Chief Constable Egil Vrekke: "There are a lot of casualties"
"But there are many hundreds of people in these buildings every day," he told the BBC. "We have to focus on the rescue operation - there are still people in the building, there are still people in the hospital." 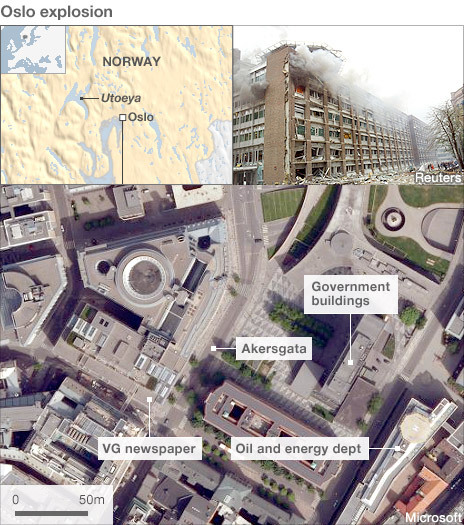 Reuters said the oil ministry was among the other government buildings hit, while NRK journalist Ingunn Andersen said the headquarters of tabloid newspaper VG were also damaged. "It's complete chaos here. The windows are blown out in all the buildings close by," she told AP. Oistein Mjarum, head of communications for the Norwegian Red Cross, which has offices nearby, said the blast could be heard across Oslo. "This is a very busy area on Friday afternoon and there were a lot of people in the streets, and many people working in these buildings that are now burning," he said. Local resident Silvio told the BBC the blast shook everything in his apartment and that he saw several unconscious people in the street. "If they were dead or not I wouldn't be able to tell you but they were receiving assistance at the time." Mr Mjarum said people across Oslo and Norway were in shock. "We have never had a terrorist attack like this in Norway - if that's what it is - but of course this has been a great fear for all Norwegians when they have seen what has been happening around the world." The United States has condemned the "despicable acts of violence" in Oslo, while the President of the European Council, Herman Van Rompuy, said he was "deeply shocked" by "these acts of cowardice for which there is no justification". Are you in Oslo and did you see what happened? Get in touch and let us know if you witnessed this event. You can send eyewitness accounts using the form below. R2 getting chased by a wampa? The Star Wars franchise feels like a aging cocker spaniel these days. Always able to bring a smile out of us, in truth it is tired, confused, and looking for a quiet corner in which to die. Cheer up though because George Lucas is wheeling it out again, this time insisting you buy 9 Blu Ray discs known as Star Wars: The Complete Saga. Annoyingly it actually looks quite good, particularly after this sneak peek at some deleted scenes was released. The video: Is it too soon for a Spider-Man franchise reboot? That was the overwhelming consensus when The Amazing Spider-Man was announced, barely three years after Sam Raimi's Tobey Maguire-led trilogy finished its theatrical run. Now, the trailer for the new film, directed by (500) Days of Summer's Marc Webb, with The Social Network's Andrew Garfield filling out Spidey's suit, has been released. (Watch the clip below.) The new rendering (due in summer 2012) focuses, just as Raimi's did in 2001, on Peter Parker's first awakening as a super-hero. There's the spider bite, the awkward experimenting with powers, and hints of the tragic death that catalyze Parker's heroism. The iPhone is now officially the most-used camera in the world, according to Flickr, and it’s camera gets better in every version. Entire subcultures of “iPhoneographers” have formed, and now there are people who shoot professional-quality images with their iPhones, and those who are obsessed with vintage photography who use the popular Hipstamatic and Instagram apps. 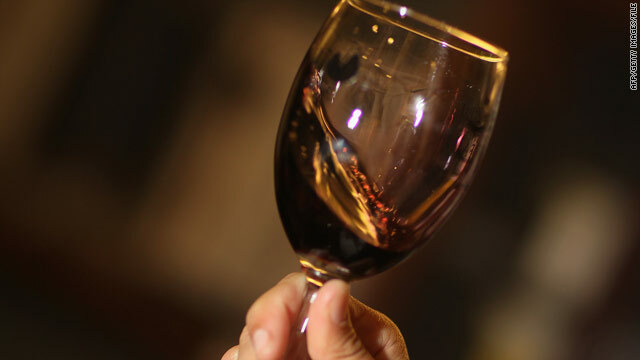 There are now even iPhone-only photography competitions and clubs! 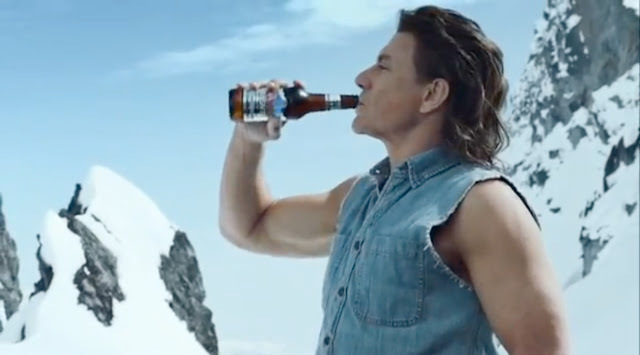 Van Damme Friday - Van Damme is here to cool you off during thisi HeatWave! !